A project that I am working on deals with DotNetNuke 6 as online help and/or Computer-based Training software (CBT) for an existing web application. Both the application and DotNetNuke manage registered users and their privileges, and DNN handles the content management for the online help contents. Note that a couple of years ago I wrote about Wikis for online help, but a Wiki (typically) does not allow for user-specific or role-specific content to be displayed, and was found as insufficient for this scenario. The solution that we came up with was that both applications are synchronized via a custom Web Service that (mainly) matches the logins of both applications and logs application access. 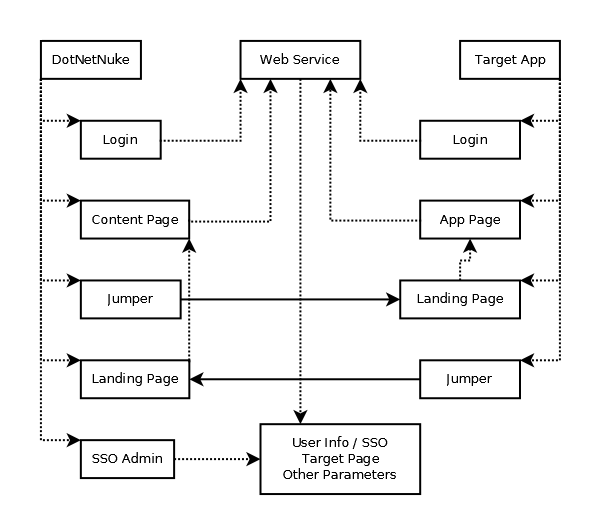 Each application needed to be extended by a hyperlink mechanism that calculates the web address of the corresponding page in the other application (usually the landing page with some parameters), nicknamed “jumper” in the chart below, and the landing page itself which performs a login based on a session ID in the URL string, and redirects to the application or content page, also encoded in a URL parameter. The DotNetNuke modules were developed using the DotNetNuke Module Development Template on CodePlex. This entry was posted on Thursday, January 12th, 2012 at 18:17 and is filed under .Net, ASP.Net, C#, DotNetNuke, Web Service. You can follow any responses to this entry through the RSS 2.0 feed. You can leave a response, or trackback from your own site.